It's a muffin and it's also a cookie. With the dawn of hybrid pastries all over the metro, Figaro, the first Filipino coffee company on its 20th year brings delectable Holiday Christmas Treats. I was with fellow foodie bloggers last Monday at Figaro Shangrila Plaza Mall enjoying the different sweet treats for Christmas at Figaro. Mr. and Mrs. Claus Muffkies (Php80) is Figaro's original muffin and cookie in one with sour cream cheese baked in the middle drizzled with choco and vanila syrup on top. It's quite romantic and sweet I thought and the confusion was forgotten after a bite of this sweet and tasty muffkies. 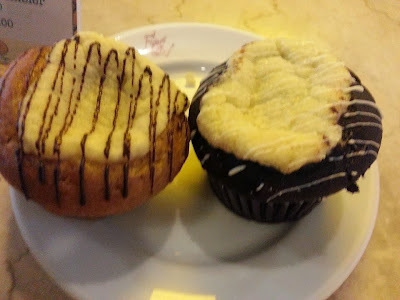 The marriage of sour cream cheese and sweet vanilla/chocolate made it a perfect dessert after a hearty meal at Figaro. The Season Fruit Cake Bar (Php85) was exactly the fruit cake I've imagined sans the rough and hard texture most prefer to play and throw at the walls for fun on Christmas. It was the fruitcake with liquor and fruit glaze bits but it's colorful and soft the women will appreciate. I loved the fruit glaze bits that explodes in the mouth at every bite. Next was the dream of the candy cane come true. Figaro's Evergreen Chocolate Brownies Decadence (Php85). It was refreshing to the mouth completing the mint chocolate experience I've expected. If the candy canes are just too sweet and I'm craving for mint chocolates in a pastry, I'd go for Evergreen Chocolate Brownies Decadence. Next chocolatey dessert Figaro offers this Christmas is their Snowfall Chewy Butterscotch (Php85). It's a bar of chewy chocolate fudge with roasted marshmallows and caramel syrup drizzle on top. I loved the roasted marshmallows depicting the snow of the Yuletide season. Finally, the most-loved dessert of the year in the Philippines, Red Velvet Cake (Php115). 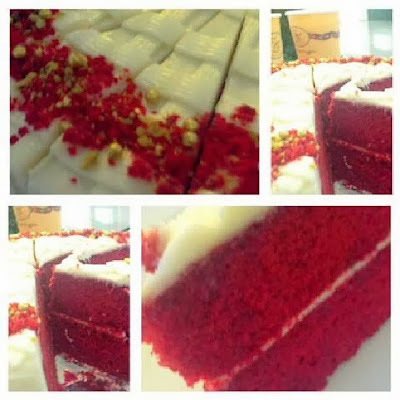 Figaro's festive Red Velvet Cake was Yuletide red with sweet cream frosting topped with red velvet cake crumbs and grandma gold ball bits that's edible and sweet for the ladies. The soft sponge cake flavored with white chocolate in red reminded me of the Christmas decors my grandma used to hang on walls and I knew that if she was still alive, she'd prefer this type of cake with latte. If the sweets made you feel guilty, Figaro now offers their Yuletide Frost (Php145). In Aloe Lychee and Mixed Berries flavor, Figaro's Yuletide Frost has Chia seeds- imported from Mexico and Guatemala. Dubbed as the World's Healthiest Food in the Planet, Chia seeds is the richest and safest natural source of Omega3. It also contains essential fibers, nutrients and antioxidants that's so good for the body. I was happy with the texture and the taste that's not too sweet and not too dry of Red Velvet Cakes making me enjoy my favorite latte with original Figaro Latte Art after consuming two cups of the Yuletide Frost on a quiet evening after work. This year, Figaro created designs commemorating their 20th year loving coffee from the crop to the cup in their gift items. 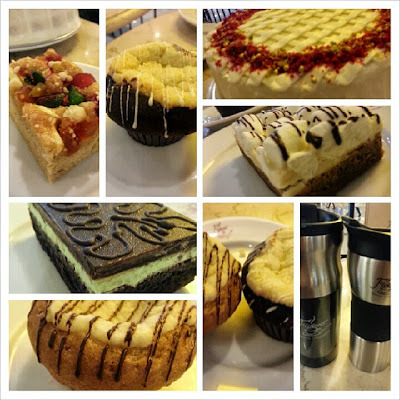 Magic Mug (Php209) unveils the map of Figaro expansion worldwide and coffee beans for the coffee lovers. I also like their Smoke Mug (Php199) in simple smoke patterns which my friends will definitely appreciate this Christmas. My co-teachers and my immediate boss will definitely hope to get Figaro's Notebook (Php175) also with 20th anniversary designs. Finally, a perfect Christmas gift for Him and for Her with Figaro's very own Premium Tumbler (Php420) - stainless steel easy grip tumbler that has convenient seal on top to protect your bags from drips and mess. I would love to receive this gift since I love coffee and I love taking my drink everywhere I go. Figaro certainly provided everything we all need this Christmas, sweet treats and jolly gift items the family and friends will love. Take that coffee passion at home and show your love with these gift items available soon at all Figaro branches nationwide. 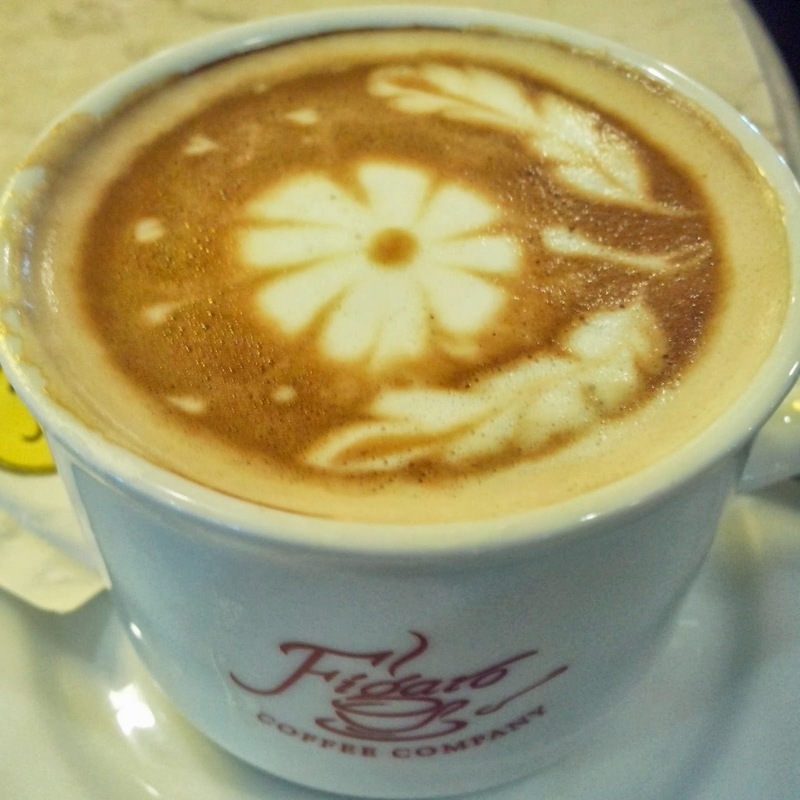 For more information, visit www.figarocoffee.com and follow @figarocoffee on Instagram and @FigaroCoffeeHQ on Twitter.